How are Cashmere Hair® Extensions different? Will Cashmere Hair Extensions damage my hair? No damage will occur, and unlike traditional salon extensions. Clip-in Hair Extensions can be reapplied and styled daily. If you are experiencing any damage, pain, discomfort to your own hair or scalp, discontinue use and consult a physician. If you are wearing them clipped-in too tightly where it is putting pressure on your scalp, remove and lower the location where you are clipping them too, it should only be attached to your hair and not your scalp. Cashmere Hair Extensions should last you 6 to 12 months, with everyday wear & proper care and maintenance. With extreme wear, 3-6 months, and with occasional wear your extensions can last for years. Keep in mind, just like our own hair, any type of heat and styling products damages hair. Avoiding hairspray and other hair products will also prolong the life of your Cashmere Hair. Do not swim, bathe, or sleep in your hair extensions, this can damage the hair and the clips. One indicator that you have Remy quality hair is the price. It is the most expensive & the price is constantly increasing. Remy hair extensions are beautiful and more natural, so they look like the individual’s own hair. It will cost more to invest in Remy extensions, the results achieved are far more stunning and long lasting than by using synthetic or lower grade hair. Remy hair extensions can be styled using flat irons or curling irons, just like your own hair. It is wiser to invest in high quality Remy hair that you can expect from Cashmere Hair because wear time & durability will last a longer than other brands. I have questions about the One Piece Extension? We are proud to offer our premium Remy clip-in One Piece Hair Extension to add instant length and volume to your hair in just minutes. The single weft is made from the highest quality human Remy hair and can be heat styled, curled, and custom cut to achieve your desired look. This clip-in One Piece weft hair extension is similar to the halo design, but instead of a string that goes over your head, it clips to the back of your head with 4 small clips. It is made by attaching several wefts sewn into one thick piece, and the hair is full from top to bottom. The clips have a silicone tubing for a secure grip even on fine/thin hair. This One Piece has one (1) weft with 4 clips and comes with one (1) TESTER PIECE which is a 1 inch wide weft with 1 clip for testing the length and color in case you need to exchange it. It comes in all of our gorgeous 25 regular shades, including our Ombre shades. Each One Piece is approximately 20" inches long, weighs approximately 110-115 grams and the top of the track is approximately 10" inches wide x 2” tall. How many tracks are included in a set of Cashmere Hair? 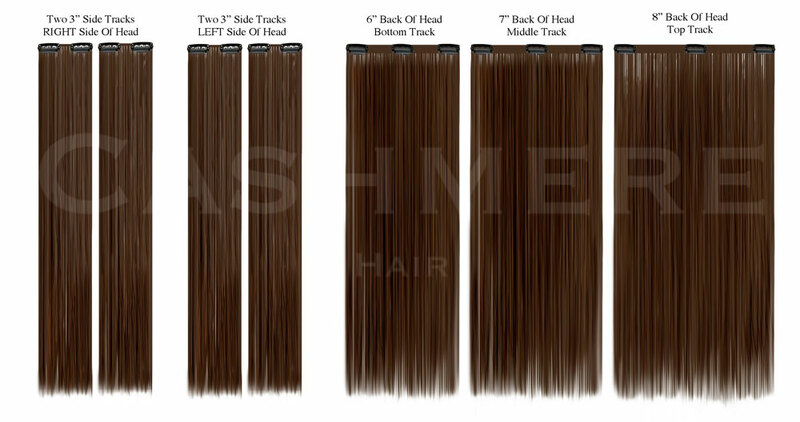 There are 7 tracks with each set of regular shade Cashmere Hair Extensions. Wrap Ponytails include (1) one piece, Approximately 100-105 grams, 20" length. Peek-A-Boos include Five (5) 3 inch wide tracks with 2 clips each. Can I purchase individual pieces/tracks of Cashmere Hair Extensions? Cashmere Hair Extensions are not available for purchase as individual pieces, they come in full sets only. How many grams are included in each set of Cashmere Hair? FYI: We measure the weight of the hair in grams. The amount of grams per set has many people thinking that determines how "thick" the hair is, but something that they don't factor in, is the length of the hair as well. The amount of grams in each set also depends on the length of the hair. Our 16" inch extensions contain 160 grams of hair, but are still just as thick as our 20" inch extensions that contain 200 grams. The weight is different based on the length of the hair. Do you sell “Toppers” or any type of extensions to cover the top of my head? At this time we do not sell toppers, wigs or clip in bangs. If you would like to be put in an email list to be notified if we design any for purchase, please email us at info@cashmerehairextensions.com. How can I get help choosing a Shade? If you are unsure on which color will match you, let our professionals recommend one for you. 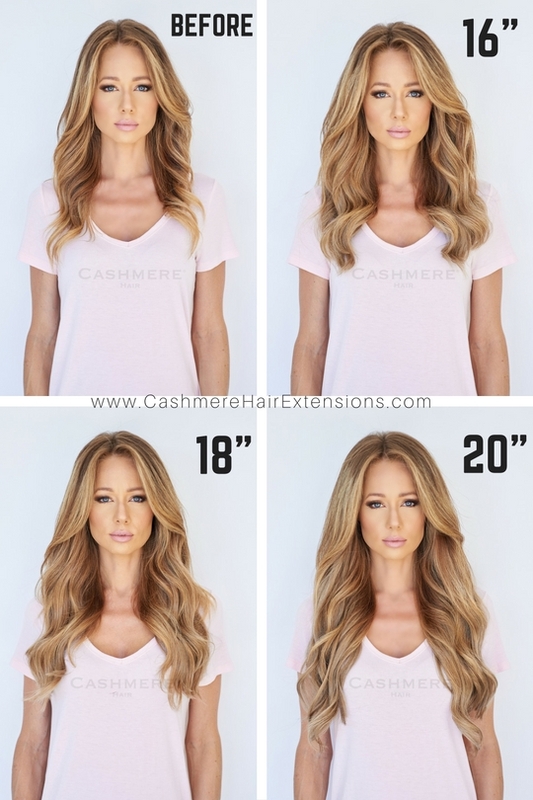 Email photos 3+ of your hair to photos@cashmerehairextensions.com. When choosing a color to match your own hair, choose a color that matches your hair from the middle to the ends. Never choose the hair color of your "roots" as that tends to be a different shade. The color match best for your hair will be the color of your hair from your chin down to ends of your hair. We recommend to some of our customers to purchase 2 sets, if your hair has 3 or more shades. Have someone else take the photos for you helps to get more accurate results. One from the front, side and back are best. Please make sure to include what the ends and back of your hair color look like, since that is the part blends with the hair extensions. Do not just send photos of your roots, or part of your hair color. Taking photos in natural light are very helpful (outside or by a window) to give us a good idea of the true color. Do not send photos that are taken in your bathroom lighting, or in direct sunlight, or at night. Send us at least 3-4 images that you think are accurate and current representations of your hair color. Do not send photos that are old and out of date as to what your current hair color looks like. Don't worry about what you look like in the photo! We don't judge you or care whether you are wearing makeup or not. Your hair must be down in photos if you want a recommendation for Clip in hair extensions, and in a ponytail for accurate recommendations for the ponytail. Does Cashmere Hair sell Gray hair extensions? There is a Tester Piece included in each regular 16", 18" and 20" sets which is located in a separate section to test the color of Cashmere Hair to your hair. The tester piece is specially designed to be clipped in to your hair to see if the color you selected is the perfect match. The tester piece is a full sized side piece (3 inches) with 2 clips that can be clipped onto the side of your head to get a great view and idea of how well Cashmere Hair wil blend with your color. This is the perfect way for you to test the shade and length of your extensions without having to break the hygiene seal. Once this seal is broken you will not be eligible for an exchange or return. Please do not wear, or use heat tools & styling products on this tester piece, if you want to return your extensions, this piece also needs to be returned in an un-used condition and be product and fragrance free. Once you are happy with your color selection, you can open the rest of the set and add this piece to it as a little extra bonus! Perfect to add to your ponytails! How can I see the colors in person before purchasing? Swatches are for your convenience, to assist you in color matching your own hair to Cashmere Hair. Swatches are a small sample of the color of Cashmere Hair, and do no clip on or attach to your head. They are meant to be used only for color matching purposes. They are a small section of hair that can be used to place next to & blend with your own hair. Swatches are for your convenience, to assist you in color matching your own hair to Cashmere Hair. Swatches are a small sample of the shade of Cashmere Hair, and do no clip on or attach to your head. They are meant to be used only for color matching purposes. They are a small section of hair that can be used to place next to & blend with your own hair. When ordering swatches, select the colors in the color family that are closest to your hair color. We know that it can be hard to tell from a photograph on a computer screen which shade of Cashmere Hair will match with your own hair color. That’s why we have SWATCHES available for you to order to see what our hair colors look like in person & to perfectly match with your own hair. This will ensure that you are getting the correct shade of Cashmere Hair Clip In Hair Extensions. 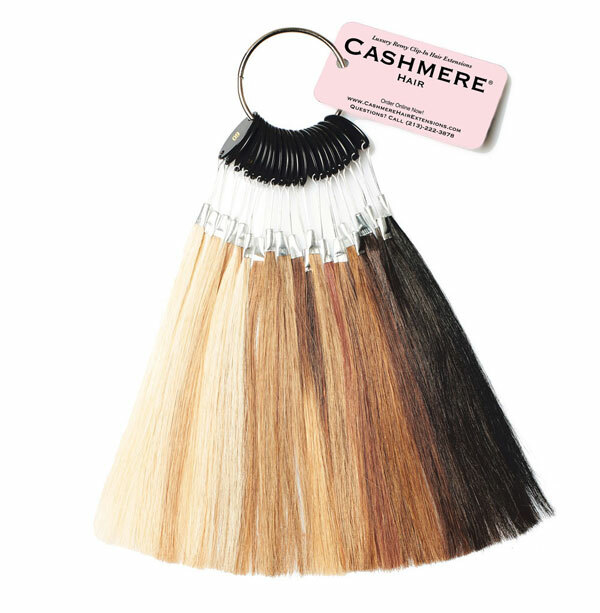 We strive to make it easier for our customers to order the right shade of Cashmere Hair Clip In Hair Extensions, so please order several color swatches to make sure that you see what shades will be the closest match. If you are not sure which Swatches to order, email us photos of your hair to photos to photos@cashmerehairextensions.com for a professional color recommendation. Are Swatches the same quality as the hair extensions? No, Swatches are for color matching purposes only and are not always the same quality as the actual hair extensions. What part of my hair should the extensions match with? When choosing a color to match your own hair, choose a color that matches your hair from the middle to the ends. Never choose the hair color of your "roots" as that tends to be a different shade. The best color to choose for your hair will be the one that matches with the ends of your hair. We recommend to some of our customers to purchase 2 sets, if your hair has multiple shades or more than 3 shades. Always match the Swatches to the ends of your hair. Can I dye Cashmere Hair Extensions? Please choose the hair extension color that is closest to your natural hair color, we do not recommend dying the hair extensions, since many of them have already been specially dyed. Our goal is to supply you with the best quality hair extensions possible, and we have a very special dying process that keeps the hair in the healthiest condition. Further dying could damage the hair. Never bleach or dye Cashmere Hair lighter. Cashmere Hair is not virgin hair and has already been color altered and processed. Therefore, we never recommend coloring Cashmere Hair & can not guarantee the outcome. Cashmere Hair is NOT responsible for any dying process that customer does to the hair. Should you choose to dye Cashmere Hair it is at your own risk, and you cannot make a return or exchange once the hair has been dyed/colored/toned. Can I use toner or purple shampoo, or color depositing products on my extensions? No. We do not recommend using toner, purple shampoo, or color depositing products on Cashmere Hair® Extensions. Cashmere Hair® is not virgin hair and has been previously dyed. Since Cashmere Hair Extensions are specifically colored to our shades, we can not guarantee the outcome of any color depositing shampoo/products, purple shampoo, or toners or dyes. Although many customers use these products and have much success, we are not responsible and can not accept any returns or exchanges on hair extensions that have been treated with dye, toner, or color depositing shampoos/conditioners/products. If you choose to test out any of these products on your Cashmere Hair® Extensions we suggest testing it on a small section or on the tester piece. Many times the hair extensions will soak up too much of the toner or shampoo and not give you the results as expected. Cashmere Hair is minimally processed. Our gentle CASHMERE dyeing process keeps the integrity of the hair at it's finest, giving you gorgeous color and long lasting hair. (Other brands use processes which rapidly dye hair using heavy acid and chemicals, causing damage to the hair.) Instead, our process of dyeing is a very slow process which is the least damaging to hair and gives you the healthiest quality hair, allowing your hair extension to look their best longest. We take the quality of our product very seriously, which is why we set ourselves apart from other companies on a completely different level of quality & authenticity. We have our strands laboratory tested and certified to be 100% Cuticle human hair, the highest quality available. We never need to mask the harsh chemical process by using silicone, because we don't use a harsh chemical process. (This technique is used to disguise the bad quality of the hair to make it feel silky when you first purchase it. After a few shampoos you might notice that the coating come off, and true nature of the quality is revealed. ) Cashmere Hair is not silicone coated. How do I clip in the hair extensions? How do I attach the wrap ponytail? How do I clip in the One Piece hair extension? I have thin/fine hair will people be able to tell I'm wearing them? No, Cashmere Hair® Extensions are easy to conceal, even with thin, fine and short hair. You will just need enough hair to lie over the top weft to cover it. Our clip-in system is different because it's designed to be worn low on your head making it easy to disguise and blend with your own hair. Backcombing the hair above the top weft can help with additional disguising it if your hair is very thin. For the majority of our customers, no teasing is required to cover the tracks. We use small clips that have a silicone strip to help them grasp onto a small amount of hair in order to stay secure. Cashmere Clip-in Hair Extensions will not be visible if worn correctly. The beauty of Cashmere Hair Clip-in extensions is that they make achieving the look of gorgeous hair natural and easy whether you have thin hair, fine hair, damaged hair, or short hair. Will Cashmere Hair Extensions stay in my hair, without slipping out? Yes, Cashmere Hair uses the best type of clips for hair extensions. Sometimes underestimated, clips play an important role in the comfort, durability, and safety of clip-in hair extensions. No matter the quality of the hair, the quality of the clips play a major factor in the length of time you can wear your clip-ins, the comfort level, and how well they stay put. Cashmere Hair's clips are small, silicone coated, and painted for maximum comfort & safety. It's important to understand these clips are designed to gently slide out if any pressure or pulling on the extensions occurs, therefore preventing stress and damage to happen to your own hair and scalp. Don't worry, they will not just slide out on their own, even with fine hair. This is one of the reasons that clip ins are a much safer option than other hair extension solutions, which also makes them a perfect fit for fine or damaged hair. To test out if this will work for you, the there is Tester Piece that is included in each regular set of Cashmere Hair that can be clipped in first. TIP: If you would like added support you can gently tease the hair just at the base where you plan to attach the clip. For even more hold, lightly spray the teased section with hairspray. Will Cashmere Hair Extensions work with my very thin hair? Yes, if you have very thin hair Cashmere Hair will definitely be the perfect match for you. You will just need enough hair to lie over the top weft to cover it. To test out if this will work for you, the Tester Piece that is included in each set of Cashmere Hair can be clipped in and tested out to see if it will work for you. Backcombing the hair above the top weft can help disguise it easier if your hair is very thin. For the majority of our customers, no teasing is required to cover the tracks. Make sure that you are wearing them as low as possible on your head. This will make it easier to disguise and blend with your own hair. Backcombing the hair above the top weft can help with additional disguising it if your hair is very thin. You also want to make sure that the extensions lay flat across your head. Cashmere Clip-in Hair Extensions should not be visible if worn correctly. If you feel like it is too much hair, you might want to consider wearing less tracks on your head at one time. The clips are hurting, what can I do? Sorry to hear that you are having difficulty wearing your extensions. Make sure that when you clip them in you are grabbing enough hair into the clip which will help to distribute the weight across the tracks. Also, because our hair extensions are thicker then regular hair extensions, and they have a lot of hair, it can be heavier than you are used to at first. Another tip is to clip them a little lower than where you parted your hair so they are not sitting right up against your scalp. Cashmere Clip-in Hair Extensions should not hurt or be painful if worn correctly. I’m having trouble clipping in my extensions, what can I do? Sorry to hear you are having trouble clipping in your extensions. Practice will definitely help, but some people have a more difficult time than others. Have you also checked out our videos to help with some tips to clipping them in? If you still find it difficult, did you know that sometimes it’s easier to get assistance with it? Ask a friend or relative! You can even take them to your hairstylist for special occasions, and have them clip in your extensions and style them for you. Most hairstylist will also wash your extensions for you and restyle them as a service if you need help. What if I’m having trouble getting my hair extensions to blend with my own hair? It can certainly be frustrating trying to figure out what will work to make the hair extensions blend with your hair. Sometimes short or blunt hair cuts are more difficult to blend with hair extensions because there is an obvious difference between the 2 lengths. Many of our customers cut & layer Cashmere Hair® to help them blend with their own natural hair. If you plan on wearing them everyday, you might also want to consider cutting your own hair to blend as well. Styling the extensions and your own hair in a slightly wavy texture will also help to blend your hair with the extensions. Can i Swim and Bathe or Shower With my Extensions? We don’t recommend swimming, bathing or showering with you hair extensions clipped in. Salt water and chlorine can alter the color of the hair, damage the clips and swimming with them can also tangle the hair. We recommend always removing your hair extensions before washing your hair and the extensions. This will prevent them from tangling with your own hair and causing any damage to your own hair or scalp. Can I go through airport security wearing my hair extensions? Yes, you can walk through security with the hair extensions without a problem. They do not set off the metal detectors. Are the Clips Magnetic? Can they be worn around strong magnets? We do not recommend wearing them if near or around strong magnets. If you work around magnetic fields, please do not wear your hair extensions. The clips have a weak magnetism. Can I go on a boat or in a very high wind situation with my extensions? We do not recommend wearing your hair extensions in very windy conditions, for example on a high speed boat, riding on a motorcycle. This may cause severe tangling and can damage the hair extensions. How often should I wash my Cashmere Hair? For most people is not necessary to wash your extensions after every use. If you find that your extensions are tangling or frizzing up, please consider washing them and using our Extension Shine Spray after they have dried to smooth them and add extra shine. If you have oily hair/scalp: Wash & Condition every 3-5 wears. After using hairspray or styling products: Wash & Condition 1-2 wears. If you swim with them (not recommended): Wash and condition immediately. How can I keep my Cashmere Hair Extensions smooth and tangle free? Use the Extension Shine Spray and brush with the Cashmere Hair Brush ONLY in between every single wear (daily) to detangle and smooth. Wash and condition with the Cashmere Haircare Set for best results. If your hair extensions start to tangle a lot, they may be too damaged and will need to be replaced. Also, please make sure you are washing your hair extensions frequently to ensure they are clean, dirty hair tangles much quicker. Why should I ONLY use the Cashmere Hair Brush to detangle my hair extensions? Brushing your hair extensions between every single wear with only the Cashmere Hair Brush in extremely important for proper care of your extensions. This brush is specially designed to prevent damage and breakage from brushing to prolong the life of your Cashmere Hair Extensions. It is designed and tested to cause the least amount of breakage and prevent unnecessary hair loss to your clip ins to keep them fuller longer. How can I style Cashmere Hair? Since Cashmere Hair comes straightened, you may need to wash Cashmere Hair before curling to help it hold curl longer for the first time. Cashmere Hair is real human hair and can be flat ironed, curled, blow dried or air dried just like your own hair. You can also use styling products on Cashmere Hair, but keep in mind that use of heat styling and products will cause damage to your extensions over time. Do not leave on heat for extended time periods. Can I cut Cashmere Hair Extensions? Yes, we encourage you to get your Cashmere Hair Extensions cut by a professional that knows how to cut hair extensions for the most natural look. Since it is a different technique than cutting regular hair, it needs to be done right to avoid a choppy look. Please make sure that you are happy with your extensions before cutting them. Cashmere Hair is not responsible for any damages once the hair extensions have been cut and we cannot accept any returns or exchanges on hair that has been cut. Do Not Razor cut Cashmere Hair. Tip: Point cutting Cashmere Hair keeps the ends looking the most natural. We are so sorry you are having trouble checking out and we are here to help you. First, make sure you input all of your information correctly. Second, try using a different browser (Safari, Firefox, Chrome). Sometimes your bank will also block your card from being used if it's abnormal activity for your protection, so please also check with your bank. If you are still experiencing issues, we are happy to help you place an order over the phone or help you figure out why your payment is not processing. 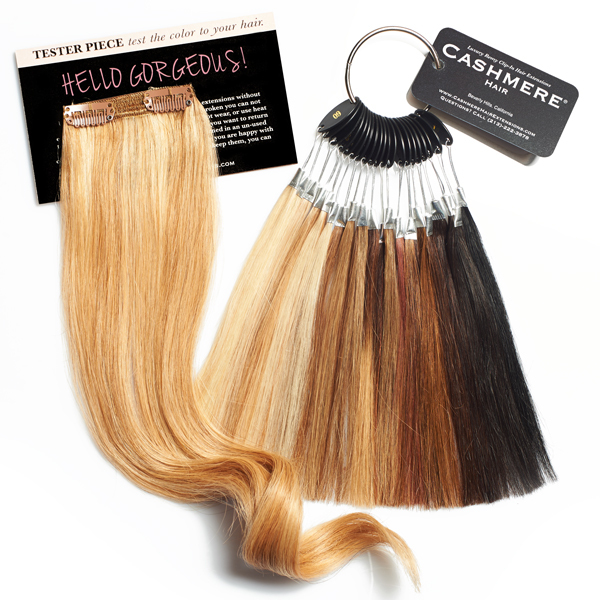 For immediate response contact us at info@cashmerehairextensions.com, or call us during business hours at 213-222-3878. You can place your order on our online store or call us at 213-222-3878 to place an order over the phone. We would be more than happy to answer your questions and concerns as well as help you place an order. Does Cashmere Hair have a return policy or exchange policy? Yes, we are proud to offer a return/exchange policy for eligible products. We understand that there may be a case in which you need to return or exchange your order. CLICK HERE TO READ OUR RETURN/EXCHANGE POLICY. Why are Cashmere Hair Extensions not exchangeable/ returnable if opened? Please understand, human hair extensions are a hygienic product. We always take matters of hygiene and public safety seriously and DO NOT ALLOW opened items to be returned for the safety reasons. This is an industry standard, & other hair extensions suppliers do not allow returns of opened items for the same reasons. 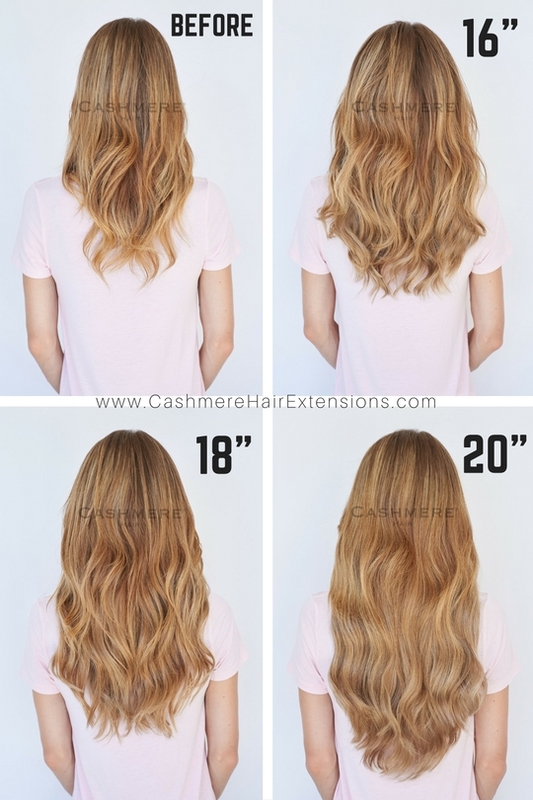 If a product is defective please send a photo of the defect along with a description within the first 30 days of receiving your order to customer service at info@cashmerehairextensions.com and we will gladly help you to resolve the issue. Although it’s an inconvenience, broken clips are an easy fix, as there are 2 extra clips included with each set of hair extensions & instructions HERE on how to replace the clips so that you can start wearing your Cashmere Hair asap. Click here to see our return policy and instructions. 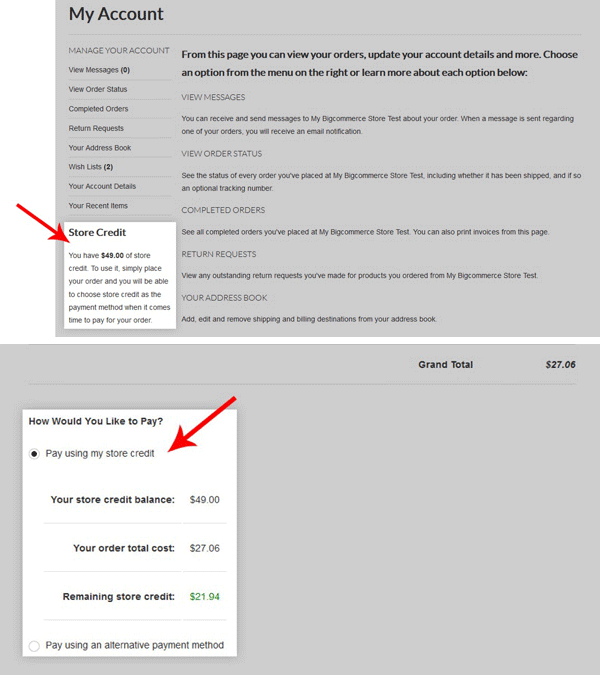 To apply store credit to an order when checking out, you need to first log into your account. Once logged in you will see the available store credit listed in the “My Account” menu. When you go to check out, you will be given the option to use the store credit to pay for your order or to use an alternative payment method and save the store credit for a future purchase. My store credit isn’t showing up in my account, what can I do? If your store credit is not showing up in your account, your return/exchange may have not been fully processed yet. Please allow 2-3 days for it to show up in your account. If it still does not show up, please call us at 213-222-3878 during business hours, or email us at info@cashmerehairextensions.com for more information. Domestic orders please enter your tracking number into the USPS.com website to check the status of your order. International orders please enter your tracking number into the DHL.com website to check the status of your order. You should have received an email with your tracking number when your order shipped. If you have further questions please call us at 213-222-3878 or email us at info@cashmerehairextensions.com so we can assist you. We are sorry to hear that you haven't received your order yet. Please reach out to us via email at info@cashmerehairextension.com or shipping@cashmerehairextensions.com so we can chat further about the issues that you're experiencing with your delivery. We are more than happy to help you track down your order. We know that it is so frustrating when you miss your delivery, and for the quickest retrieval of your order, we suggest going to your local post office to pick it up in person. If you miss your delivery, USPS will hold it at your nearest Post Office location for serval days and return to sender if you do not pick it up or schedule a redelivery in a timely manner. You can try to reschedule a delivery by calling USPS, at +1-800-275-8777 (but this slows down the process of you receiving your package and risks that you will also miss your delivery again.) We highly recommend that you pick it up from your post office immediately. Please bring a photo ID in order to retrieve it.